If you want roofing in Melissa, TX at an affordable cost, do you know who to call? Call ECO Commercial Roofing now at (833) 200-0571 for the high-quality roofing services you need! Our professional roofing contractors are skilled at providing excellent roof services, but we are specialists in customer service. We’ve been business and home roofers in the Melissa area for years, and our professionals are established members of this community. Our roofers are very knowledgeable on the many kinds of roofing, and we are glad to help you with any of your roofing questions or concerns. The experts at ECO Commercial Roofing are here to help you with all of your roof needs. A trustworthy contractor is critical when it comes to any service on your house or business. To provide clients with that peace of mind, we use top quality materials from Conklin, and we educate all of our roofers to the industry standards. We understand that the roofing you choose can impact the value of your property as well, so we provide several different roofing varieties for you to choose from. When picking, remember that while the style plays a significant role, that the long term benefits also need careful consideration. Your choice should also fall in line with the kind of roof you’ll be protecting, and your available budget for roofing. There are plenty of roofing options to pick from, and our team is happy to help you out. We provide dependable roof repairs, roof replacements, and roof installations too. Our expert services are applicable for commercial, home, and industrial projects alike. Our commercial services are perfect for businesses, shopping centers, apartment complexes, and similarly designed buildings with flat roofs. When you need your flat roof to endure without any further issues such as leaking or ponding, special installation will be required. Industrial roofs, though similar to commercial roofs, actually require stronger materials, as well as highly skilled installation to ensure longevity. Finally, we also offer reliable and cost-effective residential roofing services in a wide variety of styles. As roofers that specialize in roofing restoration, we understand more than a few techniques to work with roof coatings. From experience, we can assure you that we only utilize top quality products such as Conklin, as that ensures our roof coatings are dependable and resilient. In order to deliver superior roofing in Melissa, TX, our crew works diligently to provide unbeatable client satisfaction, with the assistance of detailed craftsmanship and expertise. If you’re looking for additionalmore information about the benefits of our Conklin roof treatments and our roof restoration techniques, give us a ring now at (833) 200-0571! If you’re looking to fix minor damages on your building’s roof, as well as to protect it from further damages, a roofing restoration is a great place to start. Your roof can go on for an additional decade with the help of one of our Conklin roof treatments. Choosing a roof restoration from a reliable contractor will save you time and money when compared to a total roof replacement. Commercial Roofing Did you know that businesses can avoid early roof replacement by investing in a commercial restoration? 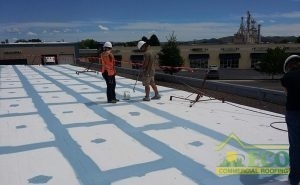 Conklin roof coatings are the go-to method of roof restoration. Available in a variety of types and purposes, you can rely on our contractors to help you determine which option will work best for you. Different coatings deliver different levels of adhesion, flexibility, and moisture resistance. The bulk of roof coatings can even apply directly over your installed roof! To discover if your roof is eligible for a roof coating, call us now at (833) 200-0571! Elastomeric Roofing Fantastic protection is simple to find with any type of elastomeric roof coating. We service several kinds of commercial roofing options, such as flat roofs and low slope roofs. If you are looking to skip issues with your roof, it is critical to start with a high quality installation. If you are searching for a flat roof solution that will endure for years, you’ve come to the right company. For all of your dependable commercial and residential roof needs, contact the experts at ECO Commercial Roofing! We don’t only offer our professional roofing in Melissa, TX, but additionally in the surrounding areas. Deciding to invest in a business’s roof will pay off very well in the future. Give us a call today at (833) 200-0571 with roof questions, or if you’d like to schedule an Estimate with our qualified roofers.